INFUS is an acronym for Intelligent and Fuzzy Systems. It is a well-established international research forum to advance the foundations and applications of intelligent and fuzzy systems, computational intelligence, and soft computing for applied research in general and for complex engineering and decision support systems. The principal mission of INFUS is bridging the gap between fuzzy & intelligence systems and real complex systems via joint research between universities and international research institutions, encouraging interdisciplinary research and bringing multidiscipline researchers together. INFUS 2019 is the first conference on intelligence and fuzzy systems. The conference will be held in Istanbul, “the only bridge in the world that connects two continents, Asia and Europe. INFUS 2019 proceedings will be published as a book by the Springer and will be indexed in Scopus. 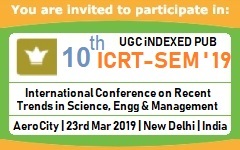 Special issues of several SCI indexed journals will be devoted to a peer refereed selection of extended papers.